Enda Stevens has three Ireland caps and made his competitive debut against Wales last month. ENDA STEVENS MIGHT have been forgiven for thinking at one stage that he had blown his chance of playing top-level football. In January 2012, on the back some eye-catching displays as part of Shamrock Rovers’ memorable Europa League run, Stevens fulfilled a boyhood dream by moving to the Premier League and joining Aston Villa, who were a top-flight side at the time. However, his big move didn’t work out. The Dubliner played just seven Premier League matches in three seasons at Villa. He got reacquainted with a level of football more akin to the League of Ireland, spending time on loan at Notts County, Doncaster Rovers and Northampton Town. At Portsmouth, he started well and rarely looked back. He featured in 90 league games during two seasons there, earning a place in the League Two team of the season as the club were promoted at the end of the 2016-17 campaign. The 28-year-old has gone from strength to strength since then, joining Sheffield United last year and promptly establishing himself as a first-team regular at Bramall Lane. The Blades are currently top of the Championship, with Stevens featuring in 11 of their 12 games so far. They sit 15 places above his former club Aston Villa, and the Irish star could well be about to get another crack at Premier League football if player and club alike can maintain their excellent current form. There was definitely a doubt [that I'd get back playing at a high level]. There was a doubt when I had to go to League Two. The phone wasn’t ringing and the only club I had knocking on the door was Portsmouth and Paul Cook,” Stevens recalls. “It was a risk going down there because if it didn’t work out, where would I have gone from there? But fortunately, I met the right man at the right time and he got me back playing football confidence-wise and fitness-wise. “The big thing with football is finding consistency, and I found that down in Portsmouth and that brought me up to getting my standards higher. Stevens has been rewarded for his good displays at club level in the form of international recognition. He made his debut off the bench in an Ireland friendly against USA last June, and also made a substitute appearance in the recent 4-1 Nations League loss to Wales, before earning his first start for his country in the 1-1 draw with Poland last month. 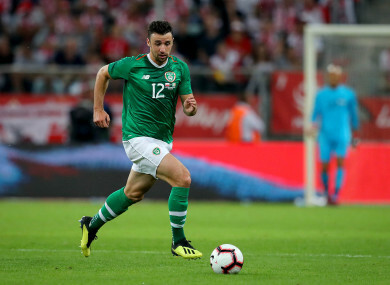 With regular left-back Stephen Ward out injured, Stevens will likely feel he has a decent chance of starting in the upcoming clashes with Wales and Denmark, but he is taking nothing for granted. “It comes down to training and training well and trying to make a good impression this week and if I do that, of course, I think I’ll be in with a chance of playing,” he says. Stevens has been impressing in the left wing-back role at club level. Martin O’Neill, meanwhile, has hinted he is considering reverting to a 3-5-2 formation ahead of the upcoming fixtures, with the Dubliner a seemingly natural fit for this formation. “It benefits me because I know how to play the position, but I have also played a lot at left-back as well throughout my career so I am comfortable playing both,” he says. “But obviously wing-back is where I have played the most consistently over the last two years so, yes, I’d be confident [about performing there]. After a couple of years in the relative obscurity of Villa’s reserves and England’s fourth tier, Stevens’ footballing renaissance could be set to continue this weekend. Email “'It was a risk going down there because if it didn't work out, where would I have gone from there?'”. Feedback on “'It was a risk going down there because if it didn't work out, where would I have gone from there? '”.